WHAT/WHO: Did you know that in 2013, just 26 percent of computing jobs in the United States were held by women? 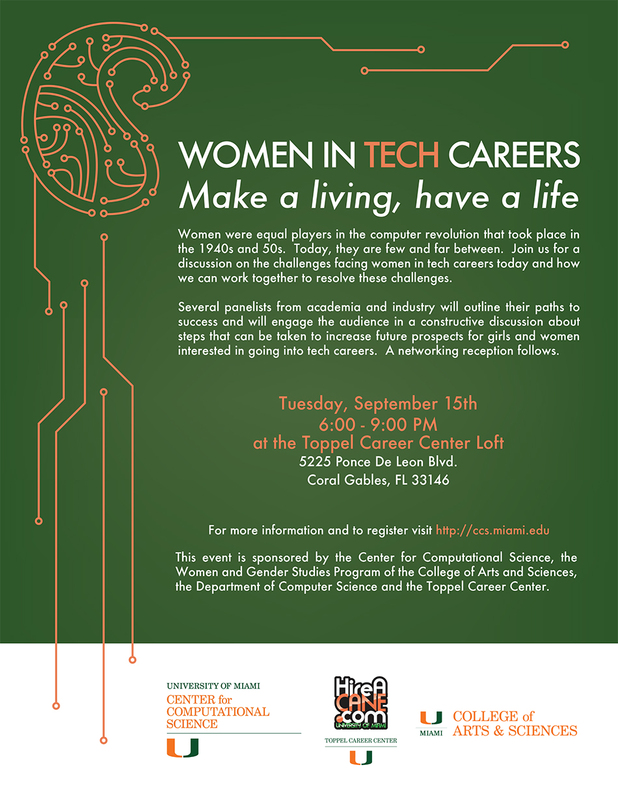 Several panelists from academia and industry have been invited to the University of Miami (UM) to discuss the challenges facing women in tech careers today, and how we can work together to resolve those challenges. The Women in Tech Careers panelists will outline their paths to success and engage the audience in a constructive discussion on steps that can be taken to increase future prospects for girls and women interested in careers in tech. The panel will be moderated by Sawsan Khuri, Director of Engagement for the UM Center for Computational Science. The event is sponsored by UM’s Center for Computational Science; the UM College of Arts & SciencesWomen’s and Gender Studies Program and Department of Computer Science; and the Toppel Career Center. WHEN/WHERE: 6 – 9 p.m., Tuesday, September 15, Toppel Career Center Loft, 5225 Ponce De Leon Blvd., UM’s Coral Gables campus. The event will open with an icebreaker game designed by Lien Tran. A networking reception will immediately follow the discussion. EDITOR’S NOTE: Media interested in covering the event should contact Megan Ondrizek at m.ondrizek@umiami.edu or 305-546-9110.